Facing a Northcountry winter, let alone a single excursion onto a frozen lake without the aid of accepted effective technology, is unthinkable. After testing Sufix 832 Ice Braid last winter, topnotch anglers reached a consensus: Why bother fishing with anything else? Not surprisingly, the new advanced ice superline, inlaid with GORE Performance Fibers, exhibits the same featherlight, user-friendly physique as its open water counterpart. "Lines for ice fishing have been evolving for many years," says Hall of Fame angler Tom Neustrom. "It's safe to say that up until Sufix 832 Ice Braid, no one had nailed it 100-percent. But the first time I spooled with this stuff last winter, I realized that this was the ice line manufacturers had been aspiring to formulate for decades. Not only is 832 Ice unbelievably thin, strong and easy to manage, it sheds water and ice so line doesn't freeze in rod guides. Anyone who fishes hardwater knows that's a major advantage." Like its award-winning predecessor, Sufix 832 Ice Braid features a tight 32-weave-per-inch composition that includes 7 Dyneema fibers plus 1 GORE Performance Fiber. In case you've been in the fish house too long, here's a translation: 832 Ice Braid is the thinnest, toughest most sensitive fishing line on ice, which also happens to shed water like duck feathers. Neustrom adds, "Sufix 832 Ice Braid possesses every key trait anglers want in a high-performance ice line. Not only is it round, thin and easy to handle, this stuff fishes with a strength and durability that seems impossible for such a low diameter line. It's also the fastest sinking ice braid available-gets me down to the fish fast. 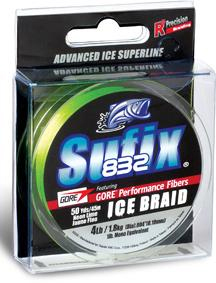 What else can I say; Sufix and Gore create an unbeatable fishing bond on the ice." Engineered using R8 Precision Braiding and fiber technology, Sufix 832 Ice Braid offers unparalleled strength, roundness and all around line consistency for the smoothest ice fishing experience possible. Available well before first ice are 50-yard spools of 4 (1-lb. diameter), 6, 8, 10, 20 and 30 (8-lb. diameter) pound test in Neon Lime and low-vis Ghost.